I recently discovered that I did not yet have a book formerly owned by William Targ, one of the bibliophiles in my library. So I ordered one from James Cummings, the bookseller from Tennessee (not James Cummins from NYC). 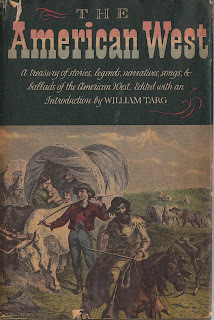 I "gave a talk" on William Targ (1907-1999) before the Florida Bibliophile Society on Oct. 16, 2005. After two or three flubs in the first few minutes of my talk, I ended up reading the darn thing. Today I want to display my William Targ collection for you. I will let the pictures and Targ's own words in his prefatory, introductory, and explanatory matter tell you about him and his books. 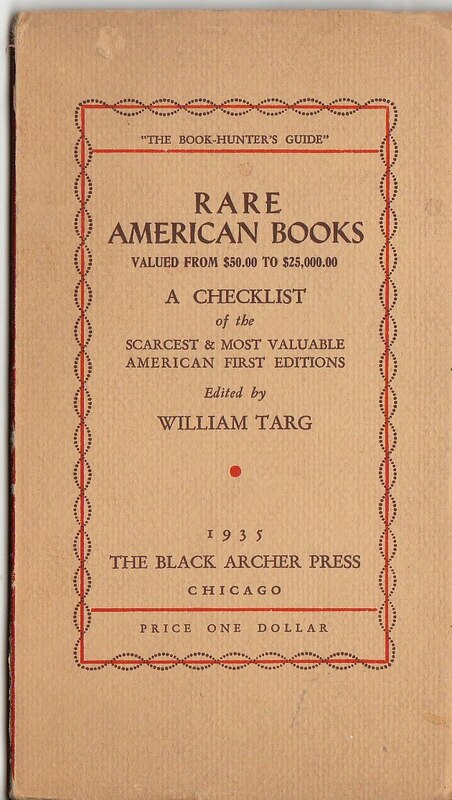 Targ's American First Editions & Their Prices: A Checklist of Foremost American Firsts, Chicago: Black Archer Press, 1930. 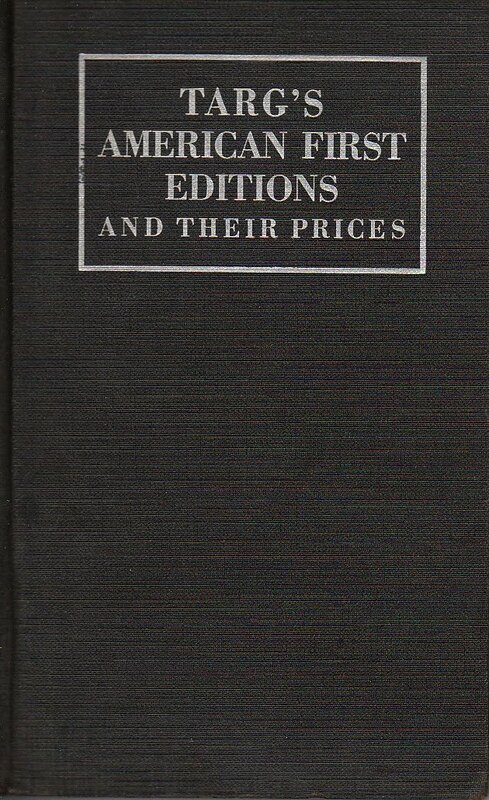 The purpose of this little book is to act as a reference guide for the collector and the dealer, to assist him in determining the authenticity of important as well as lesser American First Editions and also to give him a basis for evaluation. 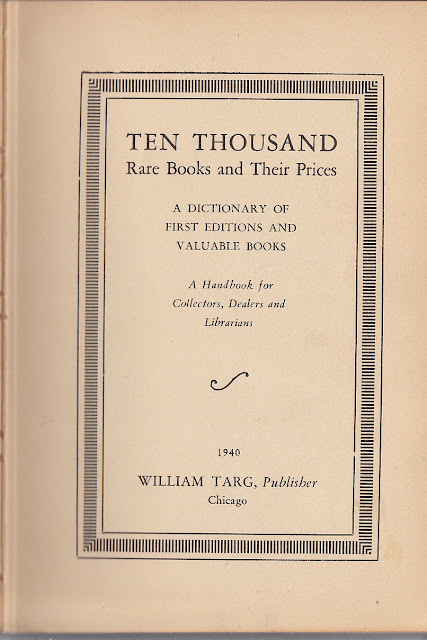 This copy, by the way, once belonged to the Long Island books about books collector, Alida Roochvarg. Her bookplate is pasted on the front pastedown. 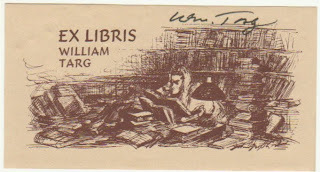 Tipped in is a postcard from the eminent proprietor of Oak Knoll Books, Bob Fleck. Confronted with a reference work such as this, the reader is inclined to hurdle the prefatory and explanatory matter to plunge at once into the information which prompted his purchase. It is urgent that you read the following before consulting the pages herein." 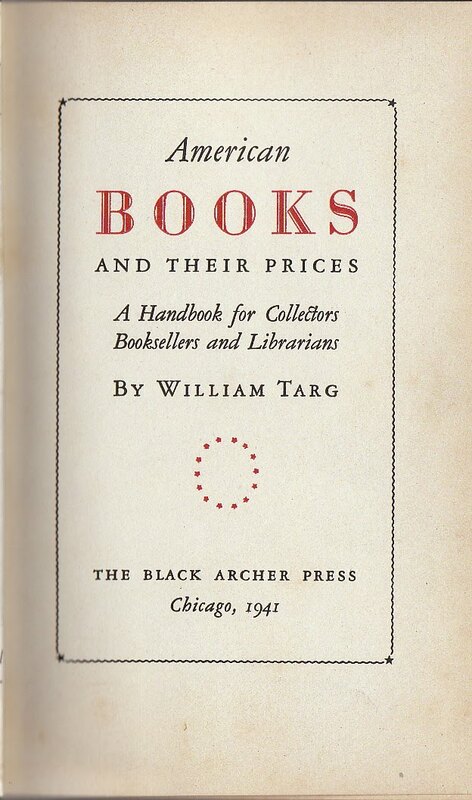 Targ then provides valuable information concerning the scope and usefulness of the catalog, the actual prices listed, the importance of a book's condition, the sources the prices have been derived from, and the points identifying specific issues of books. This volume is not a bibliography, nor is it an attempt to supplant bibliographical literature. 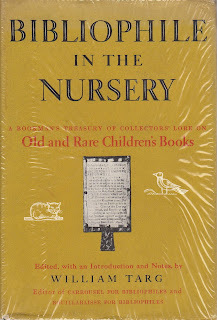 It is simply a broad selection from the catalogs of booksellers and auction sale records. 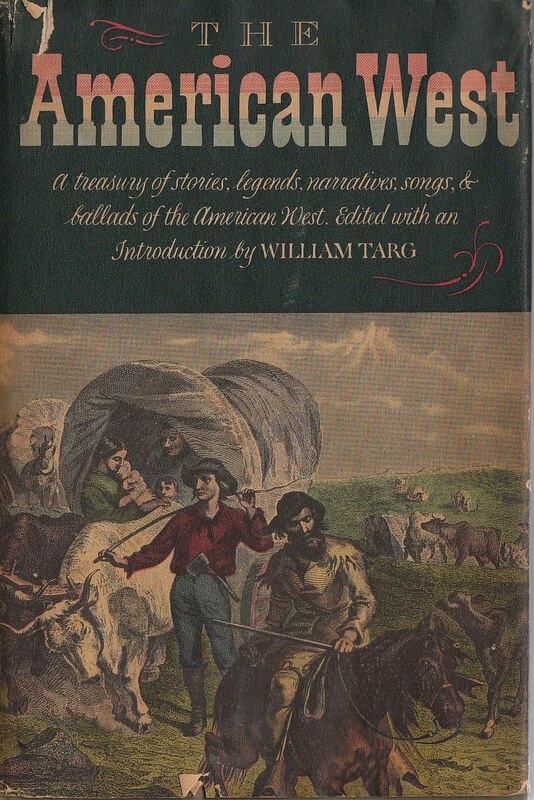 To the uninitiated, I will confess at once that this book does not contain every rare piece of Americana ever published. To include all desirable American items would necessitate a volume the size of at least the Encyclopedia Britannica or thereabouts. 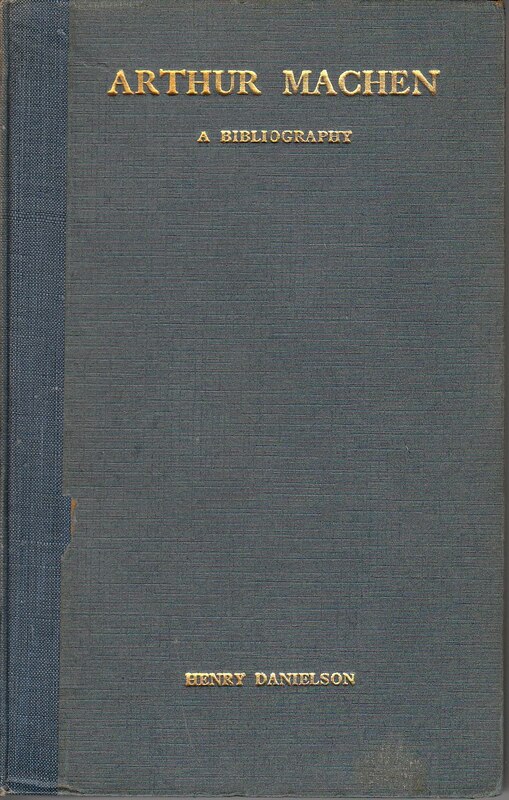 This volume, like its predecessor, is a compilation of books pertaining to the American Scene, books written by American authors, and American imprints of significance. 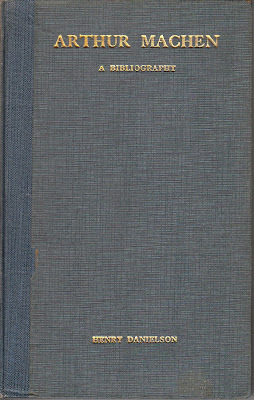 It is a supplementary work and does not duplicate any of the material contained in the 1941 volume. 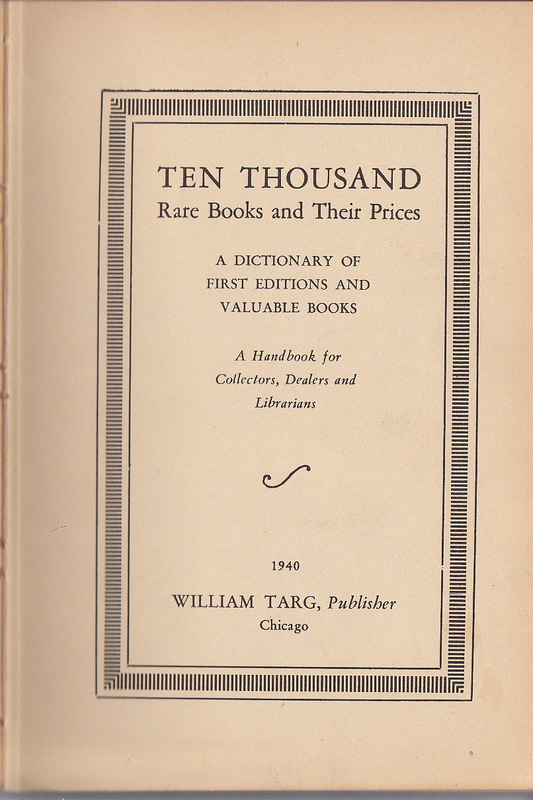 It is my hope that the purchaser recognizes the specific purpose of these volumes. It is not my intention to supplant strictly bibliographical literature; this fact is self-evident. What I am endeavoring to accomplish is a ready service for bookmen, enabling them to locate a title quickly, and give some information pertinent to identification plus a logical price by which they can appraise their book. 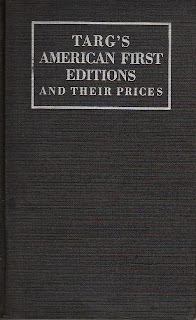 The prices found after each title have been taken from the catalogues of dealers and auction houses. 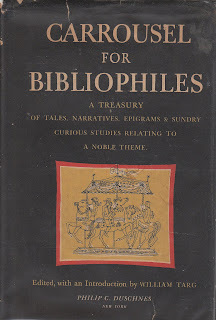 This LITTLE BOOK has been prepared solely for the guidance of the neophyte and pauper who has chosen to enter the holy portals of the kingdom of books. It is not written for the expert, the crack or the sophisticated bibliosnob––it is written for you, alone, my dear indigent but avid reader. 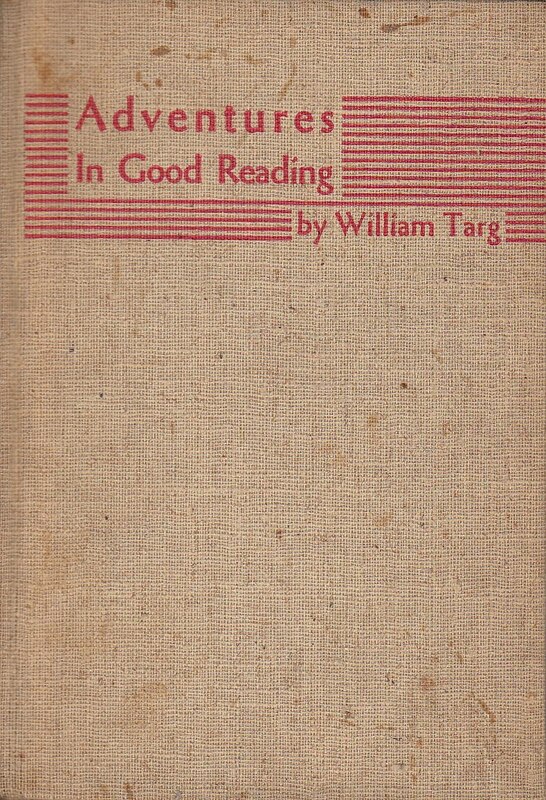 Targ's next venture was to publish a newspaper for book collectors. 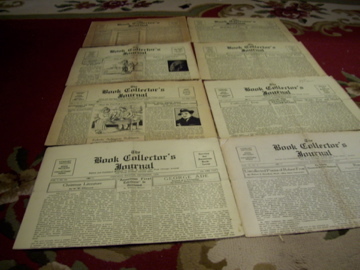 I have eight issues of The Book Collector's Journal, dating from July 1936 to February 1937. Targ sold the newspaper to John K. Potter in the fall of 1936 because it was not a money maker. Targ tried to make a little extra money from this newspaper. 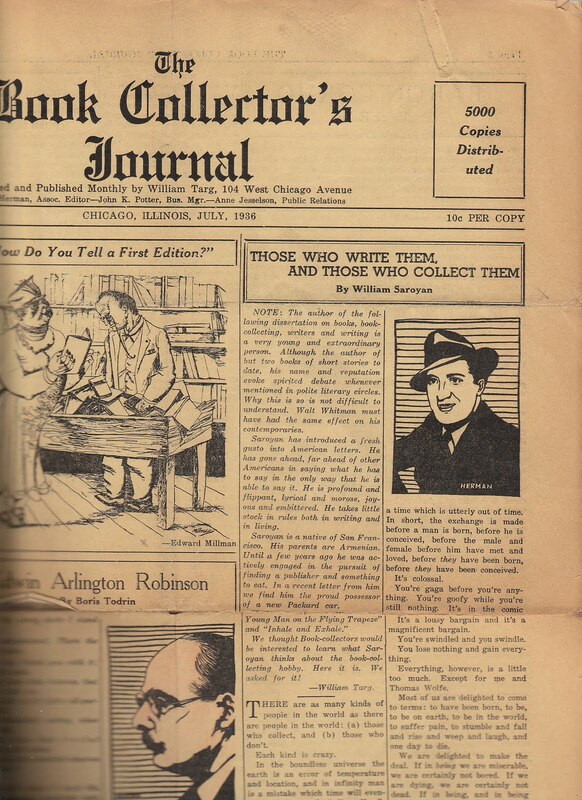 The July 1936 issue contained an article written by William Saroyan titled "Those Who Write Them And Those Who Collect Them." Targ published 50 copies of Saroyan's article and sold them for a dollar each. 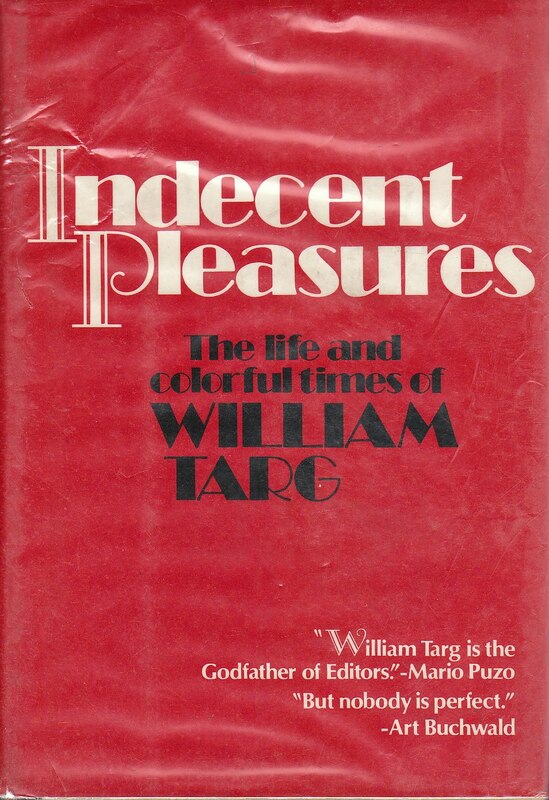 In his first autobiography, Indecent Pleasures, Targ recalls that he ran into Saroyan in a hotel lobby in the early 1970s. 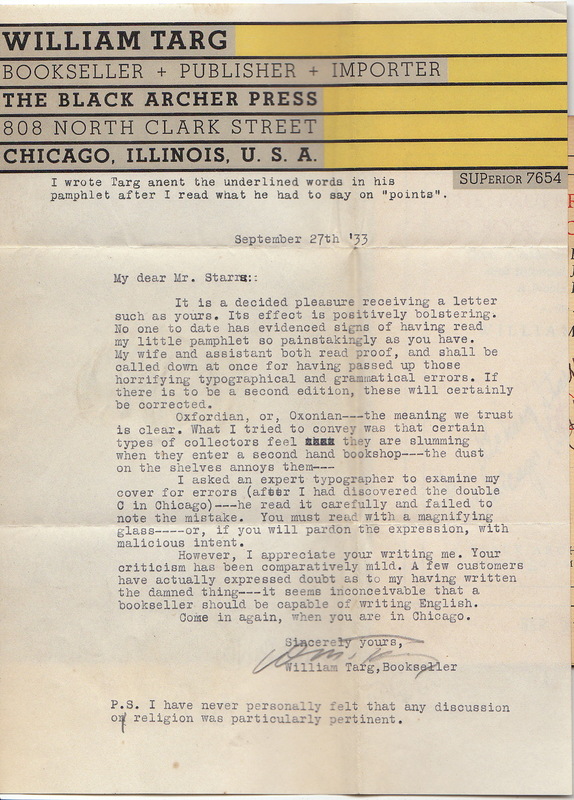 Targ said, "You don't remember me," to which Saroyan replied, "Sure, you're Bill Targ, you pirated my stuff." Targ continues,"He put his arm around me and said with a leer, 'I hear it's a collector's item.' It certainly is: I've seen it listed for $50." 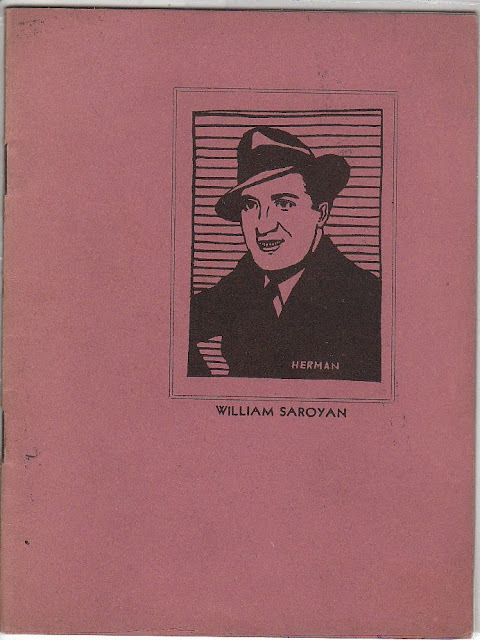 Those Who Write Them And Those who Collect Them... by William Saroyan, Chicago: Black Archer Press, 1936. Today the pamphlet is listed for $350 and up. Now that makes me wonder what the newspaper issue would list for. 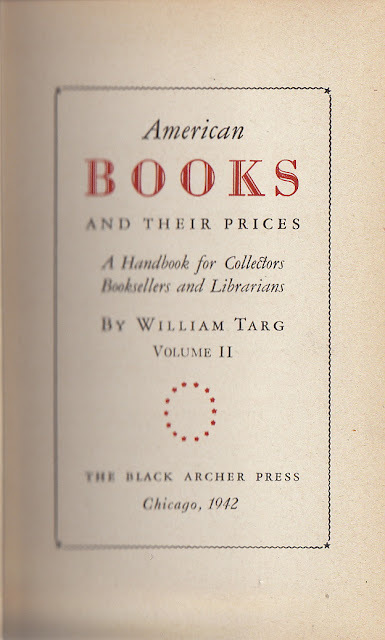 Adventures in Good Reading by William Targ, Chicago: Black Archer Press, 1940. One may read through the entire collection and still remain a relief client. Unlike the fabulous results claimed for the Club Foot Shelf, the reader may never wow a roomful of jaw-sprung people with a dissertation on the nocturnal habits of the potato-beetle. But this much is possible: the reader will very likely enjoy himself and acquire a personal philosophy which will stand him in good stead throughout the rest of his life-journey; furthermore, he may become an even more civilized and tolerant person than he naturally is. These poems originally appeared in the Chicago Tribune. 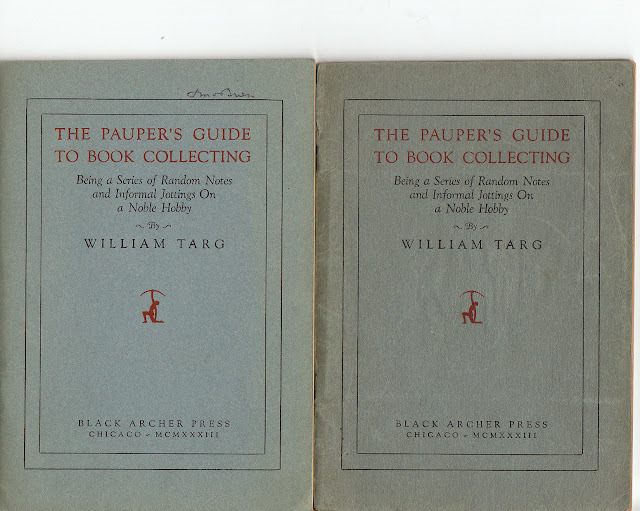 Targ wrote the poems himself. 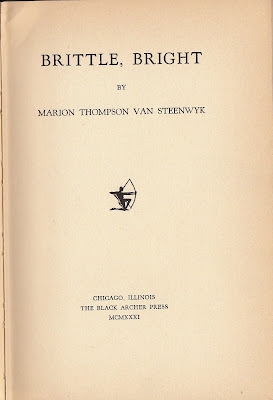 Brittle Bright by Marion Thompson Van Steenwyk, Chicago: Black Archer Press, 1931. 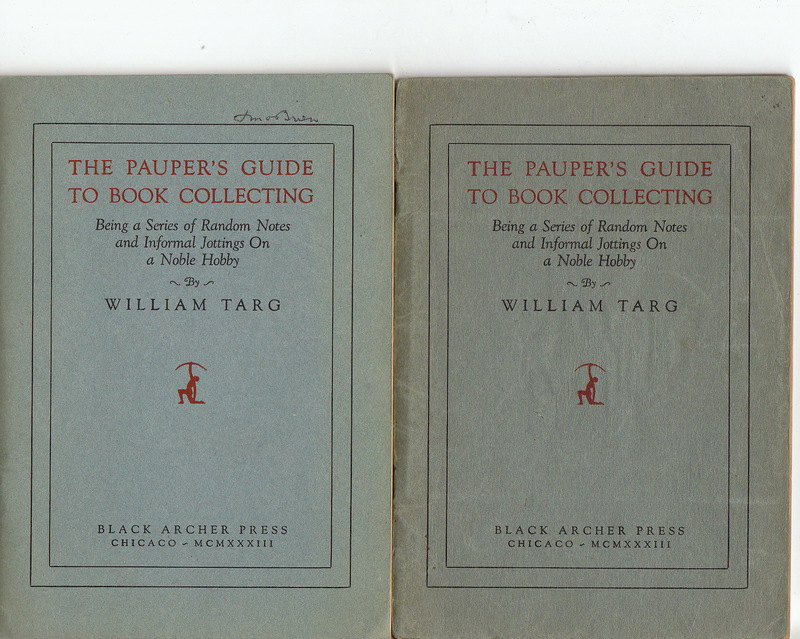 Targ published books by other authors as well, including books of poems. Nothing of note in the Introduction. But on the front free endpaper is inscribed. " For my good friend and colleague, George Lanning, with the warmest regards and good wishes of Wm. Targ 4/25/46." 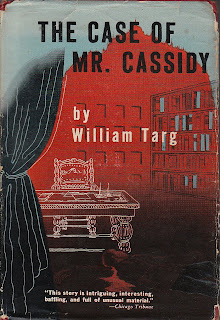 Lanning was Targ's secretary/assistant when Targ was editor at World Publishing. 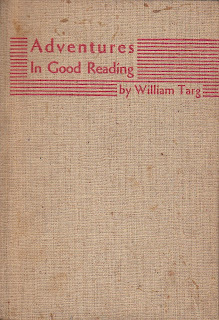 Lanning later became editor of The Kenyon Review. 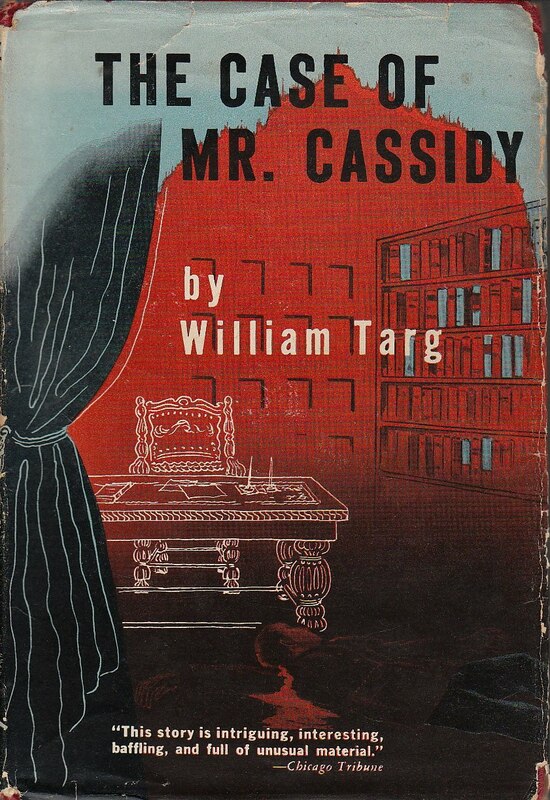 The Case of Mr Cassidy by William Targ, Cleveland and New York: The World Publishing Company,1944. A mystery Targ wrote. A good read but definitely not bestseller material. 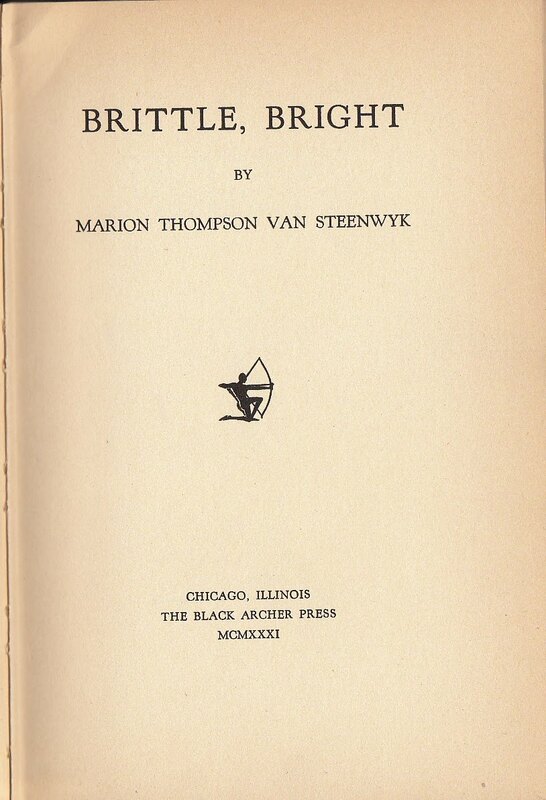 There's a teaser in the book jacket blurb that mentions the main character bumping into Somerset Maugham, Christopher Morley and Vincent Starrett on the stairs of the Argus book shop in Chicago. But that is the only contact the main character had with them. 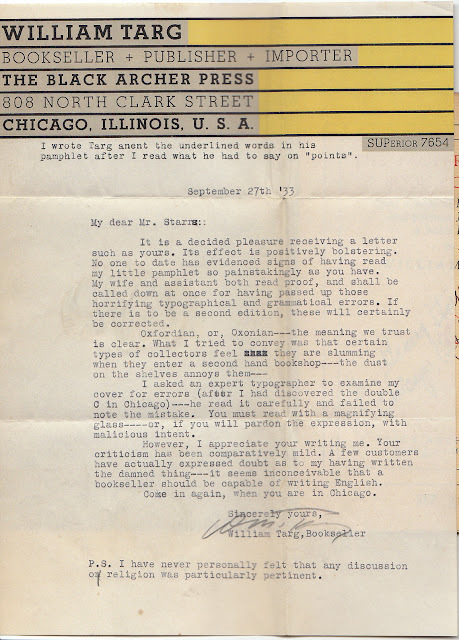 Ironically, I have a book that Christopher Morley bought at the Argus book shop, which contains a note he wrote on a sheet advertising an upcoming W. Somerset Maugham lecture. And pasted on the front pastedown are the bookplates of Vincent Starrett and Augustine Birrell! 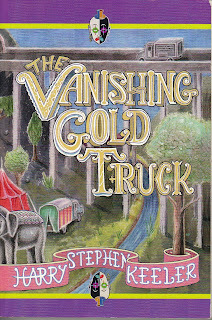 The Vanishing Gold Truck by Harry Stephen Keeler, Shreveport: Ramble House, 2005 (1941). I bought this book because William Targ the bookseller is one of the minor characters. 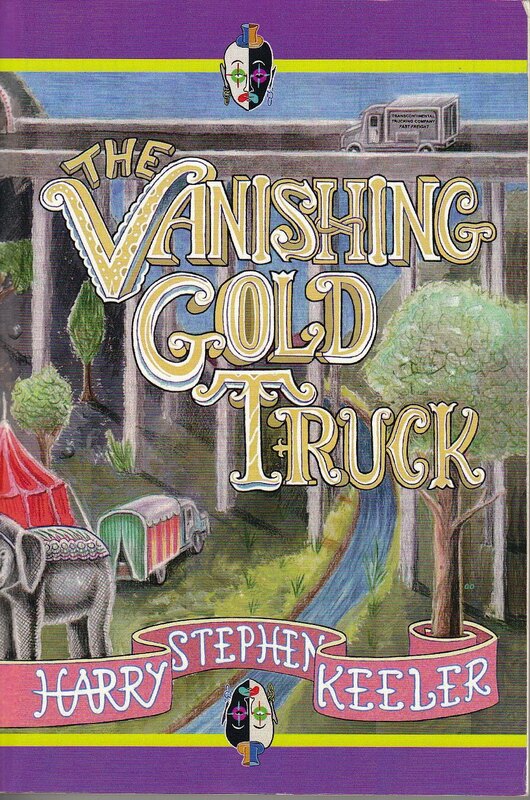 The author, Harry Stephen Keeler was a looney. He is said to have written some amazing stuff. But I don't think this is one of them. 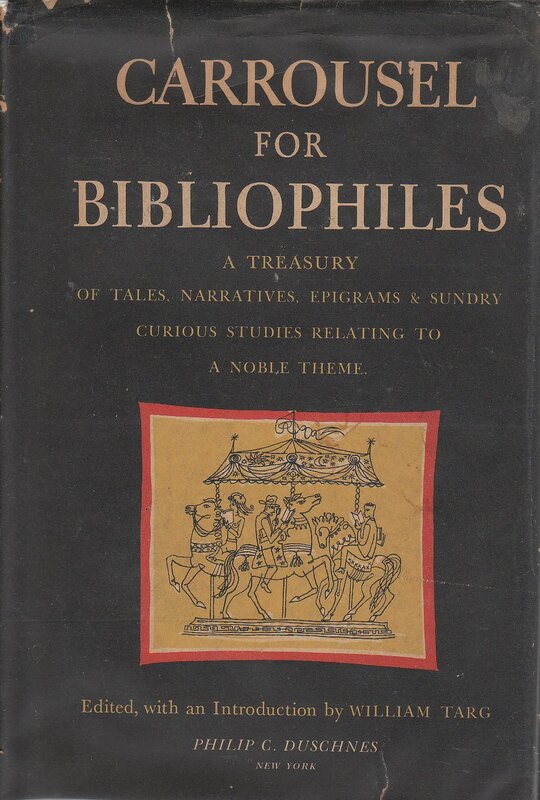 Carrousel For Bibliophiles: A Treasury of Tales, Narratives, Songs, Epigrams and Sundry Curious Studies Relating to a Noble Theme edited with an introduction by William Targ, New York: Philip C. Duschnes, 1947. We are passing through an era that will undoubtedly provide scholars of the future with endless problems. One of these will be the matter of determining a proper appellation for the age we now live. The prosaic will perhaps choose to term this the Electronic, the Plastic, or the Atomic, Age. To the astute and less academic, it will probably be known as the Anthology Age. 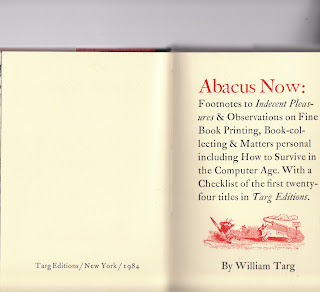 ...although this book is intended for the practicing book-collector, it is also, we hope, of interest to those timid souls who are still on the periphery, or who are contemplating entrance though the portals of this world, and need one gentle prod. 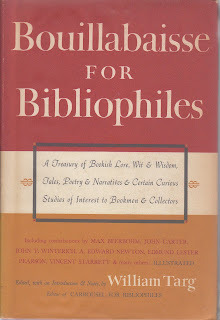 Bouillabaise For Bbibliophiles: A Treasury of Bookish Lore, Wit & Wisdom, Tales, Poetry & Narratives & Certain Curious Studies of Interest to Bookmen and Collectors edited with an introduction and notes by William Targ, Cleveland and New York: The World Publishing Company 1955. 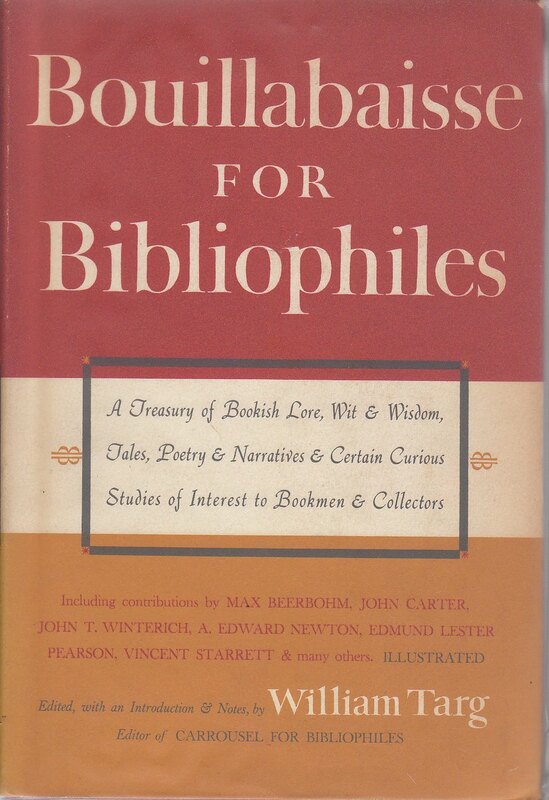 This book is in a sense a sequel to my Carrousel For Bibliophiles, published in 1947. 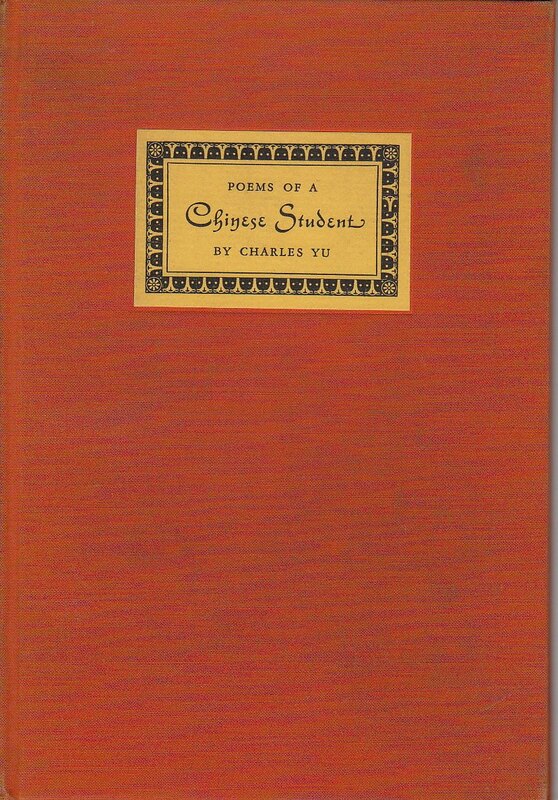 It is hoped that both newcomer and veteran find some pleasure and stimulation in the following pages. Some of the pieces are amusing, a few historical, others provocative, sentimental, solemn, nostalgic, illuminating, basic. They derive from countless sources and from a trunk-scrapbook I have been keeping over the years. Piece them all together––like a jigsaw puzzle or mosaic––and a fairly clear picture of the book-collector's world will emerge––as it was and as it is today. There are of course the inevitable, and I hope not too conspicuous gaps. 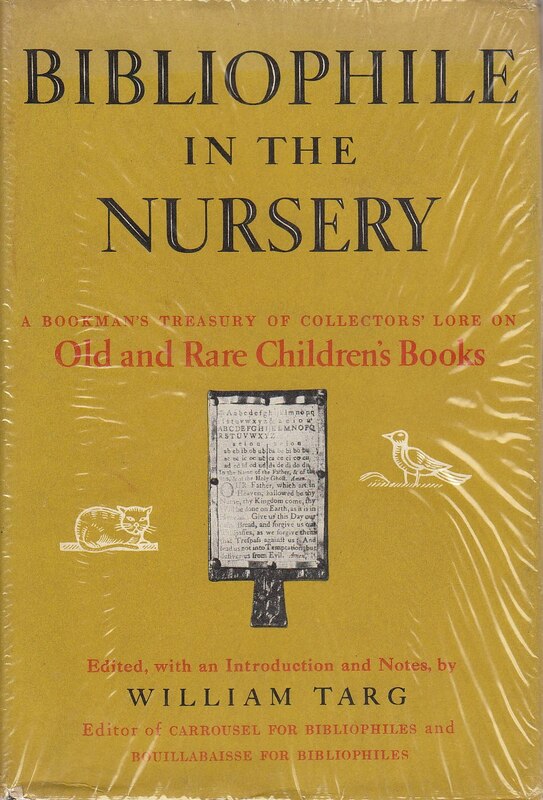 Bibliophile in the Nursery: A Bookman's Treasury of Collector's Lore on Old and Rare Children's Books edited with an introduction and notes by William Targ, Cleveland and New York: The World Publishing Company, 1957. It is conjectured by some authorities (and denied by others!) that the first book to be printed from movable type was Donatus' De octo partibus orationis. Printed about 1448, it is said to have preceded the Gutenberg Bible. It was a treatise on Latin grammar from which the children of the fifteenth century studied, and was by them popularly called the Donat. The author, Aelisu Donatus, a Roman rhetorician, was a teacher of Saint Jerome. If the arguments of certain scholars may be accepted, then Donatus, while hardly possessing the characteristics of a saint, may conceivably be called the patron saint of the Bibliophile in the Nursery. To my knowledge this notion has never been advanced before, and perhaps some scholar will wish to pursue it. 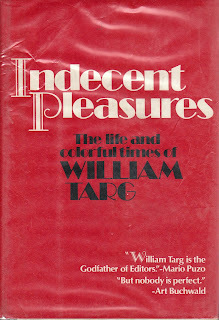 Indecent Pleasures: The Life and Colorful Times of William Targ by William Targ, New York: Macmillan Publishing Company, 1975. This book is an unorthodox synthesis. While it tries to achieve an organic form ((orderliness is one of my compulsions), I don't stick to chronological sequence; no need for that. I'm on a reconnaissance. My purpose is to show you one man's life (skipping the gummy juvenalia) within the framework of my book-publishing and bookselling history. 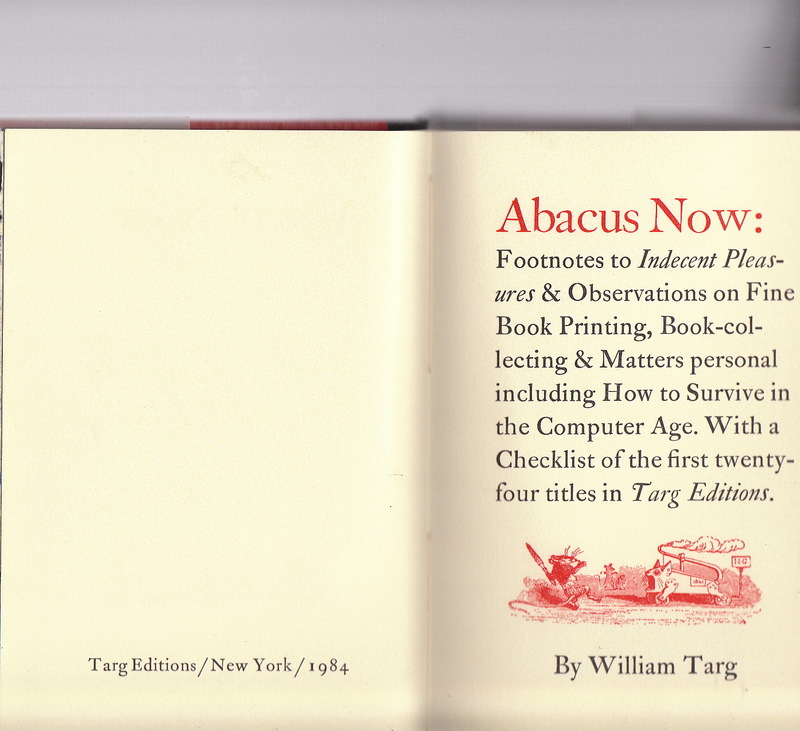 Abacus Now: Footnotes to Indecent Pleasures & Observations on fine Book Printing, Book-collecting & Matters Personal Including How To Survive in the Computer Age. with a Checklist of the First Twenty-Four Titles in Targ's Editions by William Targ, New York: Targ Editons, 1984. When my wife and I were in Amsterdam recently, we stepped into an attractive shop where only writing tools were sold: fountain pens and pencils of every description. She treated herself to a beautiful slim enamel covered pen. I bought a nine-inch ball point pen, coated in a bright red plastic. I brought it back to New York intending to write 'a big book' which naturally called for a big pen. Alas, the present little book is the result. I'm beginning to believe that bigness is not all and that big is not beautiful. If there are a few ideas or thoughts recorded here that give you pause, then I've done the job. I hope I have done the job as well. Lew Jaffe read this post and sent an image of another bookplate belonging to Targ.